I knew immediately which country I would explore- Argentina. 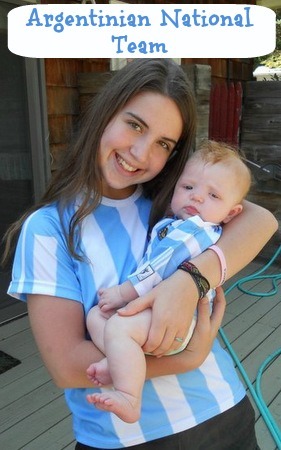 Two of my cousins have ties to Argentina (one lived there, another travels there for work). 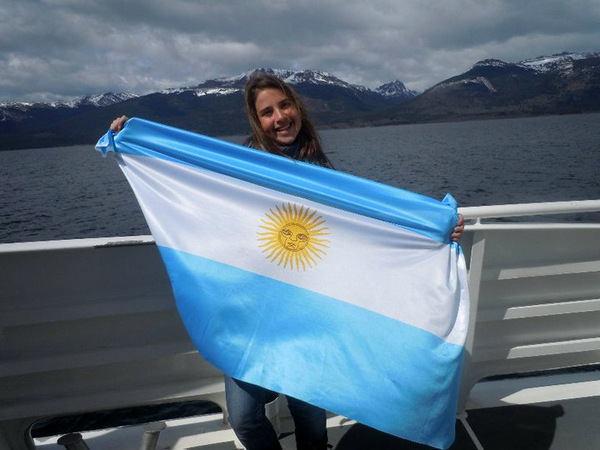 The picture below is of my cousin holding the flag of Argentina – 1 white stripe in between 2 blue stripes. A sun is centered inside the white stripe. 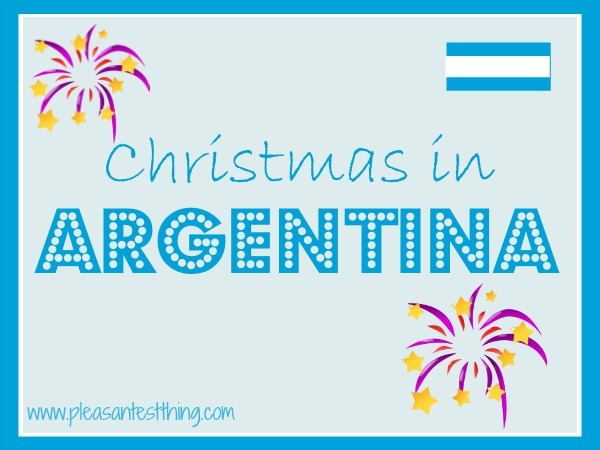 Christmas in Argentina is celebrated very similarly to the way we celebrate in the US, with tree and Santa and red and green decorations. However, one major difference is that it is very hot in most of Argentina- so Christmas is frequently spent pool-side. Everyone, including the children, stay up until midnight on Christmas Eve, when they open presents and then go outside for fireworks. 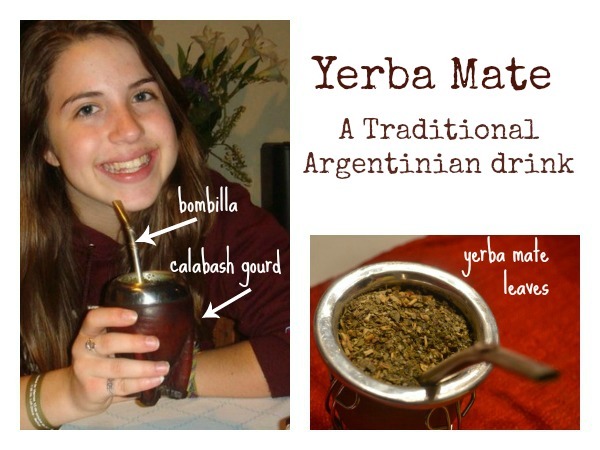 Yerba mate is a traditional drink, complete with a unique container: a calabash gourd. The drink is sipped through a metal straw called a bombilla is used to drink the tea. The tea is steeped yerba mate leaves in water. The drink is very bitter, and so sugar is often added. It is a communal drink, with everyone passing the calabash gourd and taking turns sipping from the bombilla. First the bombilla is inserted into the calabash gourd. The calabash gourd is filled with yerba, almost to the top of the top. Next slowly add hot water, pouring it only on the same place. Keep pouring until the water is almost to the top, making sure that some leaves remain dry. If sugar is being added, place it on top of the leaves at the spot where the water is being poured. The person who prepares the mate sips first. He sips until he drinks most of the water. The person preparing the yerba mate usually fills the calabash gourd with water two or three times before passing it on, because initially most of the water is absorbed and the drink is very bitter. Once the cup is passed on, the next person sips from it until the water is gone and passes it back to the original person. The calabash gourd is then filled with water again (always pouring hot water in the same place). The drink is then passed on to the next person, and the process repeats, until everyone has some. We made a fireworks art project, because that was something that is so different from our own Christmas celebration. We decided to make paint fireworks, using red and green, as Christmas colors. My almost 5 year old put blobs of green and red paint on black paper. The fireworks would be red and green, and the black paper was to represent the night sky. Using his fingers, he made fireworks sound and spread the paint around to resemble fireworks. 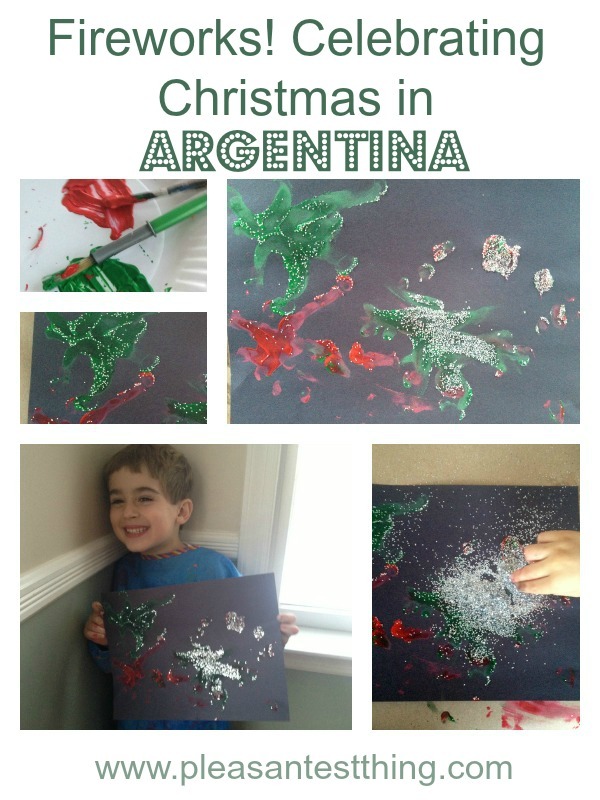 Then he poured glitter onto the paint – still making fireworks sounds! Please be sure to check out all the other wonderful traditions being discussed. Next up in Christmas around the world is Inspired by Family, who will be sharing Christmas traditions in Mexico.